← Is This Dog Bigger Than Giant George? Place: Brian’s 24 Diner, Downtown San Diego. So I randomly tried Brian’s 24 because there was an hour wait at our first choice, C-Level. Well, guess who didn’t go to C-Level either that night? Donovan McNabb. 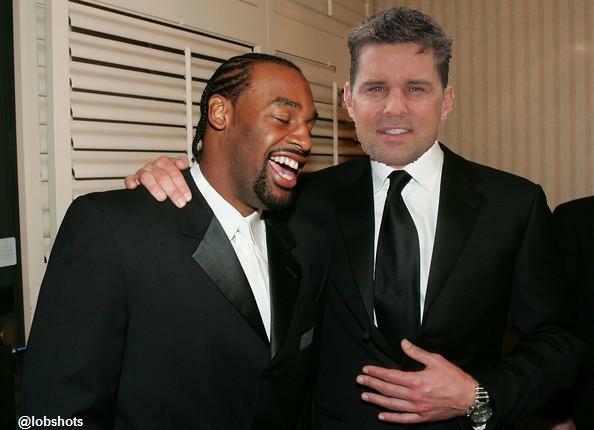 Just finishing up dinner with my girlfriend and her family… in walks McNabb… solo. Wait, what? In walks my favorite Syracuse athlete of my lifetime? By himself? Into a restaurant in downtown San Diego where, other than us, there are six  other people dining? Well, he had his choice of tables. Holy crap, what do I do? Let me just remind Lobshots readership I’m born and raised in Syracuse… and in Syracuse… ALL WE HAVE IS SU. The Orange. They’re our pro sports team. Football, basketball, lacrosse. The Carrier Dome is the dominate skyline feature. It’s a city of SU fans. We grow up Syracuse immersed… submersed… whatever. We love the Orangemen. I’m reminded of this every time I enter Nojaims grocery store [to get a case of Labatt Blue] in my hometown of Marcellus. The fashion uhhhh…terrain… is very familiar. E’rbody in ‘Cuse gear. It’s the standard. Jeans and a ‘Cuse sweatshirt. Even the marginal athletes and coaches are revered. And this was Donovan f#cking McNabb. So, an alternate viewpoint of this scenario… What are the odds, for Donovan, that he walks into an empty diner in San Diego, CA… and I’m there? This guy was my hero at Syracuse. His athleticism was remarkable. A truly captivating talent… big arm, great field awareness. I was incensed when Philly boo’d him on draft day. They were booing Syracuse… and, in fact, I felt like they were booing me… for being such a huge fan. For how “knowledgeable” Philly sports fans were… they didn’t know sh*t. But, I pulled for the Eagles all his years there because of him. Because of Syracuse. That 5 was my lucky number, and I actually wore #5 in college as well. That I also have a #5 nascar sticker on the rear window of my truck. Neat. 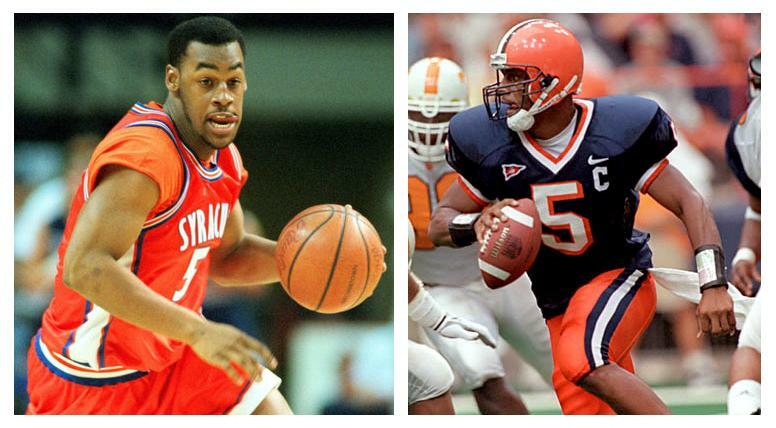 That I recently had a #5 Syracuse basketball jersey customized, and almost put “McNabb” on the back. It was a last second decision to choose [Josh] Pace, since he was #5 on SU’s 2003 National Championship squad. That’d’ve been a fun conversation. Talk about his thoughts on the 2003 team, about Carmelo Anthony (2013 NBA scoring leader) What about this years Final Four run? What he thought of Michael Carter-Williams leaving. Whether he thought Brandon Triche would make an NBA team. 1. That we’d “met” before. Summer after his sophomore year… in a bar in Syracuse called 44s. I saw him coming through, motioned to my friends, noting that he was only 20 years old, and how’d he get into the bar? Probably because he was Donovan McNabb. When I told him that… he laughed and rolled his eyes. “I was Donovan McNabb,” I could see him thinking. I asked him what he was doing in San Diego. He responded that he was doing an EA Sports event with a couple other retired NFL players at one of the military bases. And also, he loves any excuse to get to San Diego. 2. That I was at a charity event recently and “I was lucky enough to win a dinner for me and a few friends with Philip Rivers and Antonio Gates. So I’ll be having dinner with a couple of your former colleagues in a few weeks.” It was during his silent nod and smile when I realize what just went down. I’m hanging with Rivers and Gates? What? Name-dropping? I just name-dropped on Donovan McNabb? Who in the hell? Noooo!! I almost start crying in front of him, directly into the silence I’d created with my huge social gaff. Instead I gather myself and wrap it up. “Well, great meeting you again. Enjoy your meal and time in San Diego.” Yes, I did say meeting you again which makes me think I might’ve just named-dropped Donovan McNabb on Donovan McNabb. Regardless, as I’m walking away, and the waiter approaches, I turn and yell… “Remember! No chicken parm!” to which he genuinely laughed, with that famous, big ol’ Donovan grin… partially redeeming my shattered confidence. I didn’t ask for an autograph or pic… so I actually have no physical evidence of this encounter. I only have this story… and I’ll take it. The point of this exercise: our heroes are out there. Living life. Eating dinner. … Killing people? (A. Hernandez) I recommend having a few things you might want to say and commit them to memory. So, when something like this happens you might access those things, instead of winging it directly into an oncoming train… which this story clearly represents. Go Orange! This entry was posted in Feel Good Freshness, Football and tagged donovan mcnabb, Syracuse. Bookmark the permalink.